Who’s working at Heart2Heart Farms? The amazing people who make it all happen! Back in 2010, Elizabeth learned about the commercial food industry and decided her family was no longer going to support the mainstream food industry. Mainstream meant animals raised inhumanely in tight quarters, and over-processed produce so full of chemical fillers that most nutrition is lost. It wasn't long until they saw their food bill jump from $400/mo to over $1200/mo! That's not a food bill - it's a mortgage payment! They quickly realized spending that much money on food wasn't going to be sustainable. Soon after, they had animals filling the pastures and seeds planted in the soil. When not working on the farm, Liz works both as an ER Nurse in the local hospitals and as a Nutritional Therapy Practitioner, seeing individuals and working with groups on using food as medicine to heal the body. As an herbologist and fermentationist, she enjoys experimenting with food preservation and creating alternative healing remedies in her spare time. For as long as he can remember, Tyler has loved helping people. Whether he was fighting off bullies in school or defending his country, most of his strongest memories include standing against the odds, defending those in need - and loving every minute of it. After jumping from corporation to corporation (and finding little satisfaction), Tyler returned to farming, and fell in love with the idea of a life of service. Together with his wife, he passionately developed barter and work-trade systems to allow those in need to feed those they love. A few short years later = Tyler has never been happier. Other than being a good husband and father, there's no higher calling than sharing what he has, and providing a sanctuary where people can nourish their bodies, minds, hearts, and souls. When not loving on people and sharing their work, Tyler loves rock climbing, scuba diving, sky diving, and fishing! Angela came to Heart2Heart Farms after having her mother in-law move in with her, and realizing she needed to find a niche of her own. She debated getting a job in retail, not for the money, but to just get out of the house. When her best friend mentioned that the farm needed an animal care specialist, Angela jumped at the chance! One round of calf feeding and she was hooked. Angela loves being able to watch all the animals grow into healthy beautiful creatures and see each of their individual personalities develop. 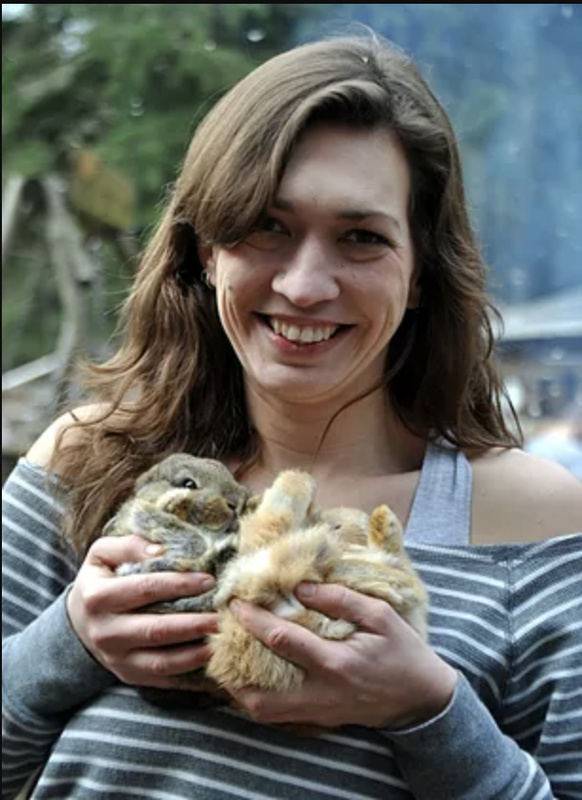 Watching the smiles on volunteers faces, as they help feed calves or pet bunnies, she claims is one of the most rewarding feelings. Working at heart2heart farms has helped Angela grow as her own person and allowed her soul to open and thrive as she finds a place in the world where she can give back and help others. When not at the farm, Angela is an artist and loves painting, as well as spending time with her husband and two daughters. Before starting at Heart2Heart Farms, Natalie was a Mary Kay Beauty Consultant, with a passion for graphic design. Upon hearing about the farm through a customer, Natalie thought she would check it out. At her volunteer interview, she mentioned she was quite good at design, which Heart2Heart desperately needed! When not working on the farm, Natalie volunteers her time and design skills with local Sherwood organizations, as well as spending quality time with her two children, two dogs and two horses. Lots of 2’s! Before Daizee began volunteering at Heart2Heart Farms, she was a Full Spectrum Doula and Holistic Parent Educator and a busy homeschooling Mama. Daizee started as a gleaner at the farms food pantry, looking for affordable ways to get wholesome food on her family's table and ended up volunteering to do pick up runs so she could give back to this awesome organization. When not volunteering, Daizee is busy raising her 3 daughters, caring for her garden, studying midwifery texts, enjoying music, camping all over Oregon and learning how to make ferments and other nutritious foods. Sue first came to Heart2Heart Farms as a way to keep her children fed while still making ends meet. She is a single mom of 3 amazing kids and worked as an elementary reading teacher. Things were really tight for her and the farms food pantry became an amazing resource, lowering her monthly food costs to almost nothing. The more time she spent at the pantry, getting to know Liz, Tyler, Joshua and the other volunteers, the more Heart2Heart Farms began to mean to her life. Sue resonated so deeply, not only with their mission, but with the way they go about it. During the summer of 2014, Deb heard about Heart2Heart Farms from a couple of friends and decided to check them out. She and her daughter were greeted so warmly and welcoming by Tyler and the volunteers that she knew she would be back. After a few months, a comment was made that there was a need for someone to run the farms Facebook page and Deb asked if she could help out. That was all it took and Deb has been helping out with social media since then! When not volunteering with Heart2Heart Farm, Deb can be found promoting literacy as an Usborne Books and More consultant and running a local 4H group. She, her husband, and daughter can also be found out discovering Oregon. Deb also loves to read, craft, network, and coupon! Amber was an Administrative Assistant / x-ray tech / phlebotomist before she had twins. Since then she has been a stay at home mom homeschooling her kiddos. She wanted them to have the small farm experience she had growing up. Through a series of events, the door to Heart2Heart Farms opened and she and her family have been so blessed! Amber is definitely looking forward to helping others with a hand up and making connections in the community, she firmly believes we are all better when there are many hands helping. As a parent she only has a short window to teach her kids empathy and hard work. Before Josiah came to the farm, his life consisted of video games, movies, and food. Josiah wouldn't say more than one or two words in a day. He now has been staying active on the farm, helping with farm chores and interacting with the farm family. He has learned about where food comes from and enjoys working outside on the farm with his brother. Josiah has since developed a dream of working as a butcher. He has enjoyed being a part of the raising of the farm animals and has a respect for the circle of life. Mark believes in America and the land of opportunity for EVERYONE. He believes ALL people can go after and achieve their dreams, so he started a woodworking business… to inspire others. Why? Because life can be hard. Mark is autistic. He saw how differently everyone treated the other autistic kids, and he didn’t want that. He began to wonder how he would ever support himself if he could not write, spell, or read very well. He was afraid he would be alone. But, God had a bigger plan. Mark volunteered with Heart2Heart Farms and they were helping him find what Tyler called his “area of brilliance.” Tyler assigned Mark project after project, but when he started working with wood, it was an instant match - and Mark’s life changed forever!